Irwin was always trying to make the planet earth a better place. Bernita said it beautifully when she wrote, "He called for a better earth but he loved the one he was in. He urged people to better their lives, but he loved each one as he found them." Socially he believed in bringing people together, and worked hard in the early 1950's as Founder and President of the New Milford Jewish Community Center in New Milford, New Jersey. He worked closely with the community to bring together people of all faiths. His concern for the environment led him not just to research clean automobiles, but to develop and market composters. But, no, the compost did not serve for fuels for his automobiles - I think that would have been next! In 1981 Irwin founded Delta Rehabilitation, Inc. on the southwest coast of Florida. He supervised a team of social workers who provided occupational and medical rehabilitation for employees hurt on the job, working through the sometimes conflicting needs of the company, the insurance carrier, the lawyer, the doctor and the family. He developed a weaving program for strengthening back muscles. He initiated and led several area-wide meetings addressing specific medical problems. In 1992 Irwin conducted research on automatic bread machines, mills, yeast, dough enhancers, and grains. Using Zojirushi automatic bread machines, he began a bread baking program initially for the handicapped. Through a "column" on the Prodigy bulletin board, he provided information about bread, grains and yeast. Reunions each spring in Tampa brought together bakers who had met on the bulletin board. His work led him to develop recipes for special diets limiting gluten, sugar and fat or adding fiber. Irwin and Bernita contributed a great deal of time and effort with the local chapter of the United Nations where, among many significant contributions they established the Tree Planting Program. An area of particular interest has always been cleaner, more efficient automobiles - particularly those that impact the environment the most - those used for commuting. He designed a transistor ignition system for the most popular car of the time especially for commuting: the Volkswagen Beetle. I remember the hours spent in the early 1960's in the basement in Woodcliff Lake, New Jersey placing the transistor ignition assembly into the plastic mold and pouring the molten plastic in to protect the electronics and then peeling away the plastic mold. I think that virtually everyone who owned a Beetle back in those days had one of Irwin's transistor ignition systems. Later in the 1960's he actually had prototypes of an electric car built. I was even fortunate enough to have been taken for a drive in one of those prototypes. It was a three wheeled contraption - different from others of its ilk in that the two wheeled axle was in front. Unfortunately, I believe, that he did not solve the problem of low weight, rechargeable batteries. In his search for commuter transportation that was both efficient and kind to the environment, Irwin wrote several magazine articles for SMALL CAR PARADE reviewing the best of this genre in the late 1950's and early 1960's. 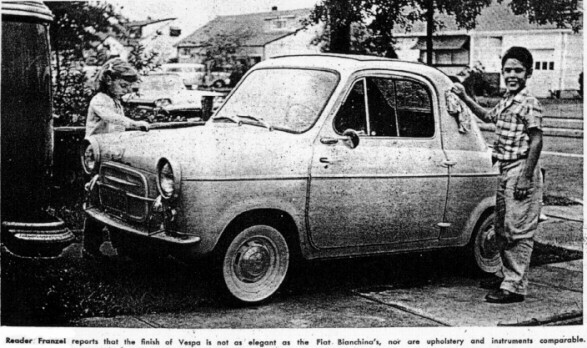 Two examples include a report on the Fiat 500 and the Vespa 400. Long before the unpleasantness of the early 40s, I had developed a soft spot in my heart for a cute little Italian car affectionately referred to as the "Topolino"- or little mouse. By the time I was in position to buck the stigma of the small car owner of a decade ago and allow myself the pleasure of owning a "Topolino," the little Fiat was no longer in production. Thirty thousand miles in a Volkswagen, and twenty thousand more in a VW Micro-Bus made me-and my six dependents, too,-devotes of the Volkswagen line. Nevertheless, when the pronouncement of the arrival of the Nuovo 500 Fiat was made, the sentimental remembrance of bygone days caused a stirring which ultimately resulted in a purchase. We apologized profusely to the sales-people for bothering them about a mere $1100 model and proceeded to thoroughly examine the little gem. The car appeared to be very well made, nicely finished and with a surprising amount of interior seating room. (Paul checked out both the front and rear seats.) Front seating is. absolutely astounding, with seat height and headroom exceeding those of many American cars. Rear seat headroom is adequate for a small boy or large pygmy in inclement weather. But on good days, the sky's the limit when the neat, efficient convertible top is down. This is one point where the Fiat body design has it all over the Volkswagen convertible. Rear seat passengers scarcely have their hair mussed by the wind in the Fiat when the top is down. The air turbulence occurs a foot or more over normal head height. My brazen flirtation with her in Hoffman's window sold me on the 500 and I placed my order at a local dealers. A couple of months passed before a shipment arrived, but my little car was in itone of the very first delivered in this country. The trip home resulted in the usual surprised looks from pedestrians and motorists alike, for here was a car that looked different. It is very much smaller than the VW, the total length being just over 6 feet, yet it looks like an automobile rather than an oversized scooter. The 500 evokes some interesting questions and comments from people on the street. Four adults getting into or coming out of the car will always stop a few passers by and invoke the invariable comment: "If I didn't see it, I wouldn't believe it!" A new twist was introduced by a little man who watched me park in a space where a grocery delivery, boy kept his bicycle: "I saw it, but I still don't believe it!" People ask, "What is it? How many miles to the gallon? end of the year, but the record of the 500 is in a different ball park entirely. In 10,155 accurately recorded and odometer-corrected miles, principally of inter-city communication, the car has actually consumed 226.9 gallons of gas, for an actual consumption figure of 44.76 miles per gallon In view of the fact that the propaganda (and the manual actually calls it that) claims the car will provide an average of 53 miles per gallon (Imperial), or the equivalent of 42.4 miles per U.S. gallon, this is propaganda that tells the truth. What about the other aspects of owning a new small car? Well the car, which now has about 14,000 miles on it, seems to be standing up well. Tire wear is minimal, and all indications are that they should last for 30-40,000 miles. Aside from normal stretching and the necessary adjustment of the control cables, nothing seems to have loosened up. A few minor defects have come up, of course, but these have been easily repaired. Some trouble was encountered with clogging of the carburetor pits due to dirt left in the gas tank, but this too is easily corrected. Service poses a bit of a problem. Many of the dealers who have taken Fiat as a side line have not provided the spare parts to back up or technical know-how to allow their mechanics to service the cars. One local establishment doesn't even own a service manual and seems to think that the sale of a few dozen cars in the thousand-dollar price range doesn't justify the formidable twelve bucks that this manual costs. Well, I think its worth it, and so I own one. There is a big educational program going on, however, which is sponsored by Fiat. I have spoken with Mr. Stefano Lisa of the Fiat school in Maspeth, L. I.., and if the dealers take advantage of their training program and parts depot arrangement, service will rapidly fail to be a problem. To the tinkerer, who will be fascinated by the tiny two-cylinder air-cooled engine, maintenance will not only be easy, but actually fun. There are only two grease fittings on the entire car-for king pin lubrication. Almost everything is easy to get at and spare parts can be obtained at Hoffman Motors on about one day's notice by mail, or over the counter. All in all, the little Fiat 500 more than satisfies my desire for the "Topolino" of days gone by. I expect to put many more thousands of miles on this one-and then buy another! The Vespa 400 is a real automobile. In many respects it is as different from most other cars as it is from the scooter for which Vespa is long famous. It is very similar to the small Fiat Bianchina that has enjoyed considerable popularity since its, U.S. introduction last year. There might have been collusion between the body builders as the accompanying photos ill indicate. The similarity in appearance, however, is the only thing these cars have in common. The Fiat has an air-cooled, two-cylinder, four-cycle engine of 29 cubic-inch displacement and the Vespa uses two-cylinder, two-cycle 24 cu.in. engine, also air-cooled. The Fiat is rated at 17 horsepower and the Vespa has 20 horsepower. In the normal course of events, I commute to work in my Fiat Bianchina. For several days in October, I used a Vespa 400. I think that the differences are interesting and sufficient to sell quite a number of Vespas for the delivered price of under $1,100, complete. At first sight, I was surprised by the extremely small wheels of the car. It has 4.4 x 10-inch tires and the Fiat uses a 4.6 x 12 size. The Vespa's independent four-wheel suspension and these very small wheels and tires keep the unsprung weight down to what is probably an unprecedented low. This, no doubt, accounts for the sensational, riding characteristics. The ride of the 400 is better and considerably less choppy than the ride of the Bianchina. The surprise to the uninitiated is the generous interior room to be found in these tiny cars. While they are essentially two-seater jobs the rear can be used by children or for toting luggage or parcels. The engine is a rather silly looking affair perched in the middle of a large-volume rear compartment-large only by comparison with the engine. 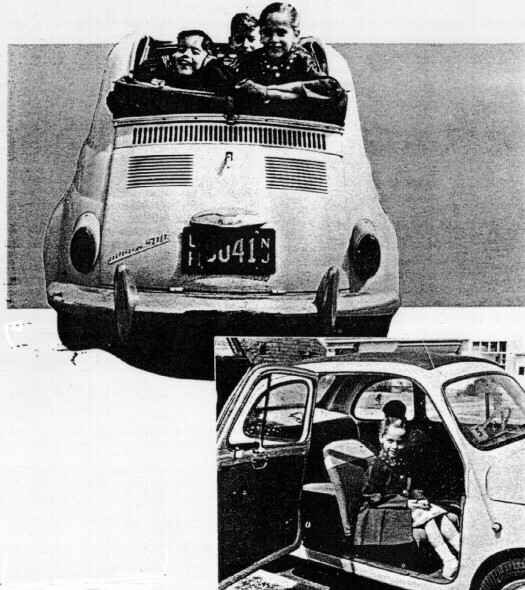 To get a better idea of the engine size it might be pointed out that the Vespa has just a third of the cubic capacity of the Volkswagen engine, th the cubic capacity of the Rambler American, and about 1/12 th the capacity of the regular-sized Ford engine. The power-plant is an air-cooled, two-cylinder, two-stroke engine with an extremely low oil to fuel mixture ratio. Rather than attempt to translate the somewhat amusing manual, which is written in dialect, permit me to quote it directly. "Owing to the very reduced rate of oil to be mixed with petrol (2%) one can say that it will not need any more oil at each refueling than the necessary amount to assume lubrication for the same range of a,4-stroke engine. 'At least you will not use more oil than if you have had a 4-stroke engine vehicle, which must be temporary drain out and fill up with new oil." In other words (and they may be no clearer than the ones above), if we assume that the Vespa does 50 miles per gallon of gas (the economy is actually better) then it will use 20 gallons per thousand miles of driving. With a 2% oil-fuel ratio, it will consume 4 gallons or 1.6 quarts of oil per thousand miles. This is less than any current 4-stroke engine would require for a 1000-mile oil change interval. The ingenious mechanism and metering system for adding the oil to the fuel is worth mentioning. The fuel tank holds approximately five gallons. In other 2-stroke cars that I have driven, when the gas tank is full there is no room to add oil. This means that refueling has to be watched carefully to leave room for oil, preferably in integral quarts. (Editor's note: The oil should be poured in first.) Failure to add oil to the fuel is probably responsible for more frozen engines on 2-stroke cars than you could shake an oil can at. In the little Vespa, however, the engineers worked out a good solution. There is an oil reservoir in the engine compartment which holds about a half gallon of oil. (On the basis of the assumptions above, this would be enough for 1200 miles of driving.) After the fuel tank is filled, a dial is set to the number of gallons added, and a little hand crank is turned to reset the dial to zero. This meters and mixes the correct amount of oil into the fuel. Let's get back to the question of ride. Handling is superb in spite of a slight tendency to over-steer. Different tire pressures might reduce the over-steer tendency. Steering is so light and accurate that, in my experience, there is no comparable handling car. One detail of the steering assembly could use some of the thinking that went into the oil-mix gadget. The steering mechanism is actually within the car, and above the driver's leg. While this protects the rack and pinion from the elements and produces a very interesting steering geometry, it does have a grease fitting that could allow some of the lubricant to drip into the left trouser cuff or other points not requiring lubrication. Therefore, the driver should look out for unwiped grease fittings at this point. The three-speed transmission is synchronized in the two top speeds, and top is an overdrive ratio. The transmission-differential assembly is quite noisy in top gear. The low-speed torque or pulling ability, as might be expected in a 2-cycle engine, is also very good. Personally, in spite of much favorable comment that has been published to the contrary, I feel that there is too much of a spread between the ratios of low and high gear to be satisfied by a single intermediate ratio. A fourth speed would probably allow more rapid acceleration on starts, while the three-speed box might encourage sales to some locals who couldn't tell a gear shift lever from a lollipop. Actually, the engine can be throttled down to about 15 mph in high and picked up without lugging, so my objection might not be too serious. Acceleration in the lower speed ranges is superior to that of the Fiat. Up to this point, the Vespa 400 compares more than favorably with its look-alike, the Fiat Bianchina, but now, the moment of truth. What does the purchaser lose for the roughly $200 difference in price? The finish of the Vespa is not nearly-as elegant as that of-the Fiat. The upholstery, trim and the instruments are not quite up to the Bianchina standards. The Bianchina has small luxury touches while the Vespa is more on the utilitarian side. The Vespa's window gasketing for instance leaves something to be desired. If I owned one, I'd cement all of the window gasketing in place instead of relying on the little metal tabs to hold it. If you are in the market for a miniature car, by all means look over and try these Tone-type twins, as they are just about the lowest price transportation you can buy. The Vespa as previously mentioned has about a $200 edge on the Bianchina. I feel that there is a very definite market for this kind of car in the United States. They are ideal for the commuter who recognizes the sheer waste of dragging a large, hungry vehicle to work with him each morning. Commutation costs in the little cars are comparable to bus fares, while allowing freedom of motion and privacy. These cars are really fun to drive as much as any car I've driven. They are well suited for the urbanite, who has to park on the crowded streets of big cities. The overall length of 112 inches is just half the length of a standard car. It's surprising how many parking space possibilities present themselves when you're cruising around in these little cars. If you're in the market for "fun-to-drive" transportation, plus fuel economy that sometimes reaches as high as 60 miles per gallon be sure and look over the Vespa. I believe you'll find the car's handling characteristics and it's 50-55 mph cruising ability a pleasant surprise. "An important step in the Chapter's Tree Planting Program took place July 7 in Sarasota when our members and officials from Sarasota County planted ten live oak trees, paid for by the Chapter, in the children's play area of the lovely Gillespie Park, just north of the downtown area. A good number of UNA Board and long time members were present along with County, Habitat for Humanity, Sarasota Bay Rotary, and Gillespie Park Homeowner representatives. The event received prior mention in three Sarasota newspapers and two television stations covered the ceremony in their evening news. The broadcasts took special note of a UN-USA Donation plaque now permanently in place in the park. In brief remarks prior to the planting, the president expressed special thanks to Irwin and Bernita Franzel of the Chapter who first raised the tree planting idea. After receiving Chapter approval, they worked assiduously to develop an environmental improvement program through which hundreds of trees were planted In Sarasota and. Manatee counties. The president expressed appreciation for the many financial contributions which individuals and groups made to the overall project in response to Irwin's appeal to help improve our environment."